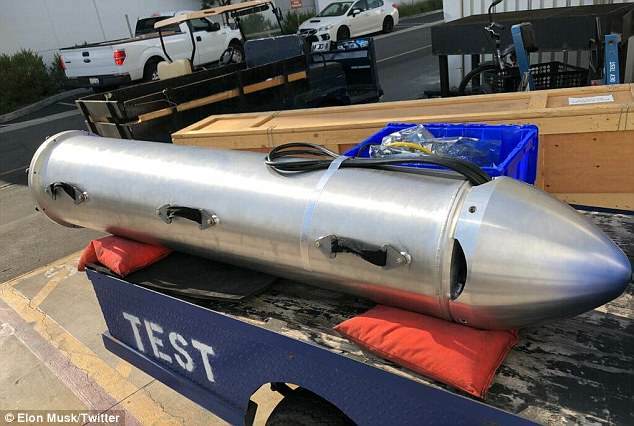 SpaceX founder Elon Musk tweeted photographs and video of his 'mini-sub' that he has left in Thailand in an effort to help authorities rescue members of a boys' soccer team trapped in a cave. 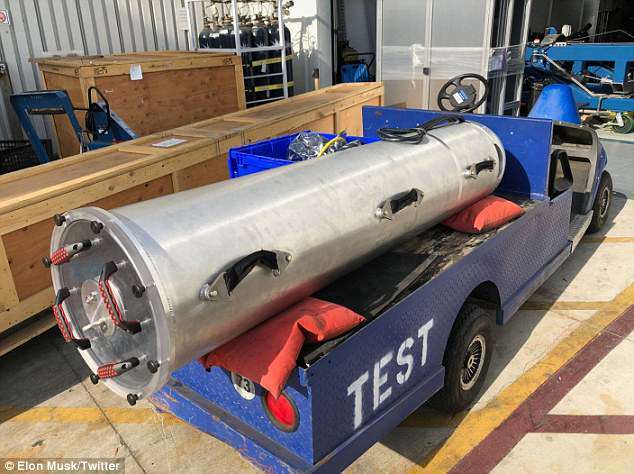 Musk is in Thailand to tout his 'child-size submarine' that he says he is willing to leave in Thailand to help the boys - although with two-thirds of them rescued he may be a bit late. 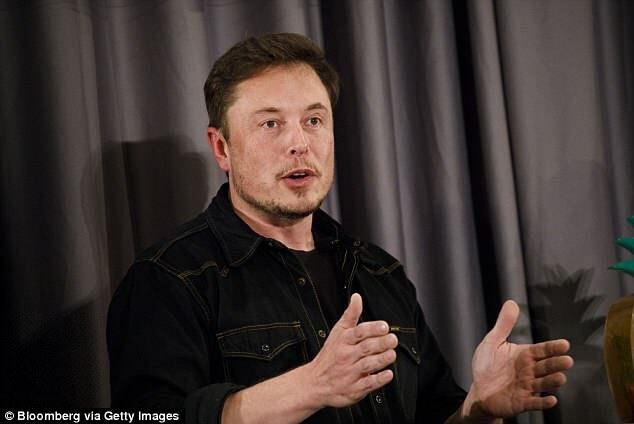 On Twitter and Instagram, Musk posted images showing himself in 'Cave 3' - although there is no confirmation that that is where the trapped boys are located. 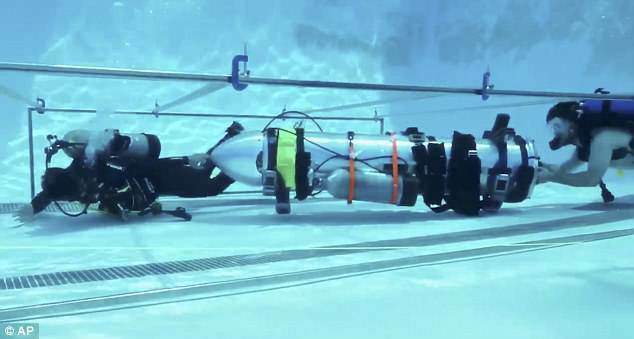 The prototype revealed by the billionaire Musk on Monday shows a large metal tube with a nosecone that is meant to serve as the mini-submarine that would help the members of the youth soccer team to safety. Officials from Musk's Boring Company and SpaceX traveled to Thailand to offer their assistance, but it appears that the Thai government has managed without them. Musk, who is in Thailand, tweeted on Monday: 'Just returned from Cave 3. 'Mini-sub is ready if needed. It is made of rocket parts & named Wild Boar after kids’ soccer team. 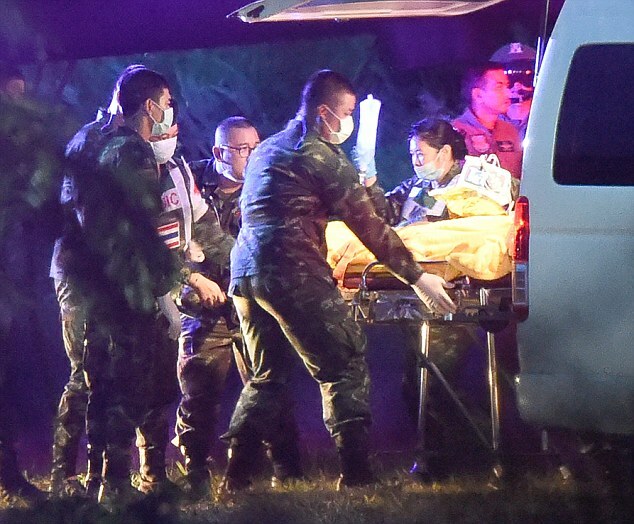 As of Monday evening, eight boys have been rescued from the flooded Thai cave. As the second group of four finally breathed fresh air yesterday, officials admitted the youths’ football coach faced spending a night alone in the dank, dungeon-like tunnels. Rescue chief Narongsak Osottanakorn refused to rule out 25-year-old Ekaphol Chantawong being left inside the cave if the four remaining pupils are rescued today, because the divers’ system of taking that many at a time was working well. ‘For safety, the best number is four,’ he said. Meanwhile, adding to their parents’ torment, the boys are not being allowed to hug them due to infection fears. They are being quarantined in hospital but are said to be in ‘good health’. 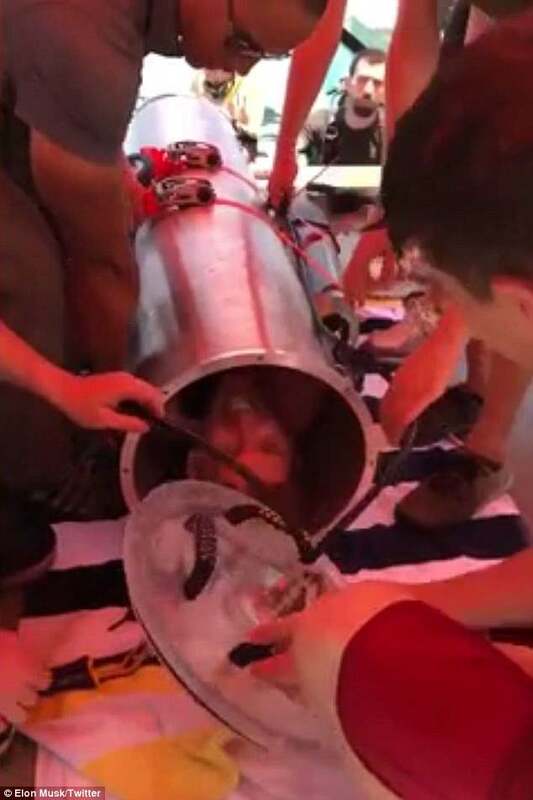 Yesterday the British-led rescue mission resumed with four more boys from the Wild Boars football team extracted to safety through miles of claustrophobic underground tunnels. Incredibly, they could not even swim before their ordeal. From their dedicated ward, the boys have demanded meals of pad krapow – a Thai comfort dish made from spicy pork, basil leaves and rice. On doctor’s orders they are getting no more than baby food, Mr Osottanakorn revealed. Anxious parents of the first four had to wait 24 hours before being allowed to see their sons – and even then with no physical contact allowed. 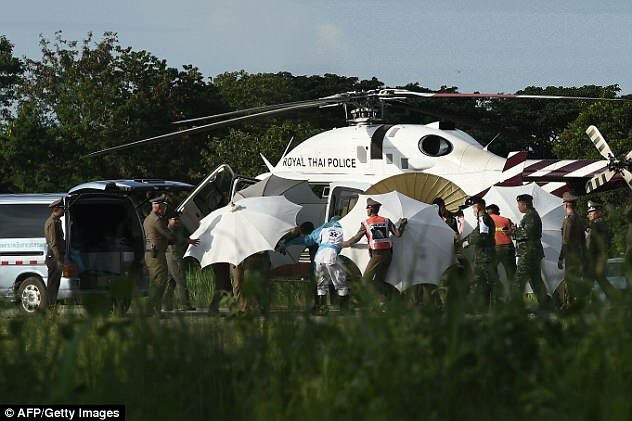 The Thai authorities have refused to name any of the rescued boys until all of them are out. Once again, British cave experts spearheaded yesterday’s operation which involved more than 100 divers. 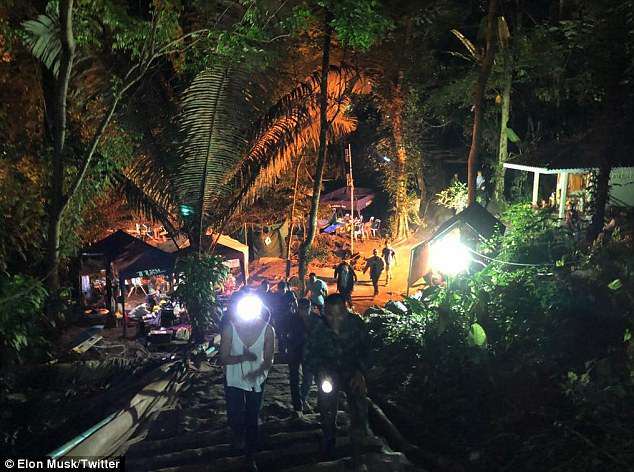 Seven Britons chaperoned the boys through the treacherous tunnels as part of a team that included 18 international cave divers and five elite Thai navy SEALS. 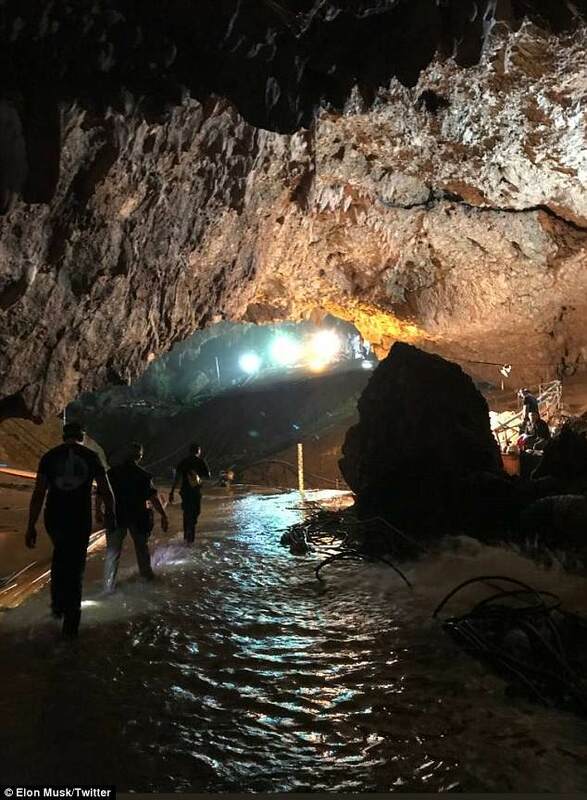 Scores of other volunteer cave divers from around the world helped by delivering air refill tanks and tightening the guide rope along the route, which includes ten ‘choke points’ where the mud-clogged tunnel is terrifyingly narrow. Friends of the British experts claimed they ‘never panic’ under water and would be keeping reassuring eye contact with the children. Wearing full-face masks, the boys either swam or were pulled along. Yesterday’s nine-hour mission – starting at 11am – was two hours shorter than Sunday’s. Last night the Thai prime minister flew to the cave to thank the rescue squad, and said the ordeal should serve as a wake-up call to all children to avoid it happening again.